Pendragon Castle sits on the east bank of the River Eden off the B6259 in the Mallerstang Valley on the way from Yorkshire into Kirkby Stephen. It’s a square, squat ruin of a tower that was once three storeys tall in a beautiful landscape. It stands on a platform of earth and its walls, what remain of them, are over four meters thick. The chap best known for owning Pendragon Castle is Hugh de Morville and he probably occupied it after Henry II’s campaign in Scotland. The name de Morville might ring bells. In addition to being Lord of Westmorland he’s also one of the four knights who helpfully murdered Thomas Becket in Canterbury Cathedral in 1170 after listening to Henry II ranting about troublesome priests. Instead of the expected reward de Morville found himself kicked out of his properties with a flea in his ear. Ultimately the castle passed through a couple of families beginning with the de Viponts who were de Morville relations before ending up in Clifford hands through the inheritance of Idonea de Vipont. We know that Robert de Clifford was given permission to crenellate Pendragon Castle in 1309 but he didn’t have long to enjoy it because he got himself killed at Bannockburn in June 1314. The reign of Edward II was not a comfortable one for the English. In addition to the Scots gaining the upper hand in the Scottish Wars of Independence there was also the small matter of several rebellions against Edward II in England. 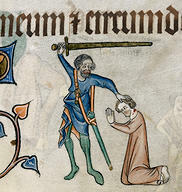 Robert’s son Roger was executed after the Battle of Boroughbridge. (Click on the image in this paragraph to open a new window for my post on the Battle of Boroughbridge) Ultimately it came back into the Clifford possessions but turned to a pile of rubble after an unfortunate accident with a band of Scots and a blazing torch in 1341. It was 1660 when Lady Anne Clifford turned her attention to rebuilding Pendragon castle “at great cost and charges.” She noted in her diary that she stayed in Pendragon for three nights on 14 october 1661. She went on to renovate Mallerstang Chapel as well as ensuring that Pendragon had all the amenities including a brewhouse and a wash house. Spence records that the hearth returns reveal that there were twelve fire places in Pendragon and that Lady Anne Clifford wrote her will whilst she stayed there. After Lady Anne Clifford’s time it returned to ruin and even in the seventeenth century during her time it had acquired the tradition of belonging to Uther Pendragon – in one version he died there when the Saxons took the castle. But just so we’re quite clear the ruins on display today were definitely built in the twelfth century as Mallerstang Castle although Westwood and Simpson observe that the de Cliffords might have renamed it during the reign of Edward I when there was a fashion of all things Arthurian. Roger de Clifford – the Second Lord Clifford. Roger Clifford, the 2nd Baron Clifford born in 1299 at Appleby Castle inherited the title, estates and inherited role of Sheriff of Westmorland upon the death of his father at the Battle of Bannockburn in 1314 at the age of fourteen. It was never a good idea to inherit as a minor as it could play havoc with estate income but 1314 was a particularly bad time to inherit property in the North of England. The Scots took advantage in the military ineptitude of Edward II to raid the borders, into Durham and on into Yorkshire. 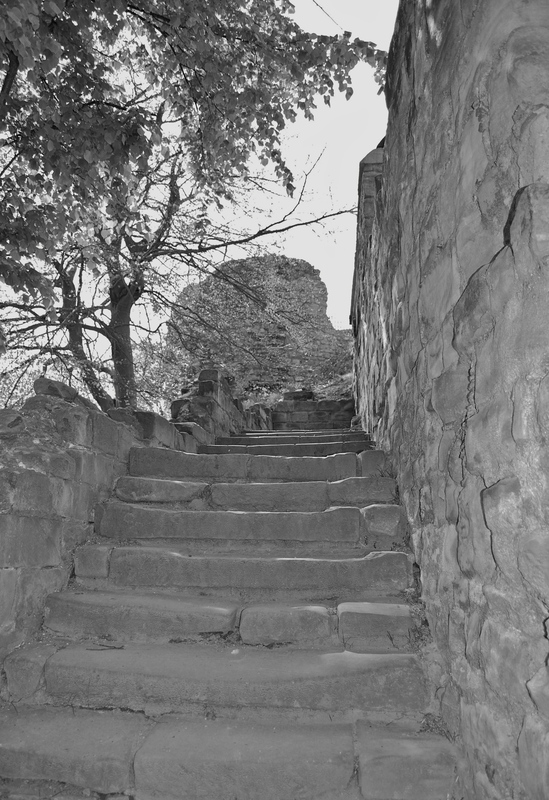 Skipton Castle was soon withstanding Scottish marauders. Little wonder then that Roger, when he attained his majority, found himself drawn towards Thomas of Lancaster, Edward II’s cousin (His father was Edmund Crouchback, Edward I’s brother) a man of sound military experience. Through a complicated series of manoeuvres King Edward II was forced to form a council with Thomas of Lancaster at its head. The goal was to try to make some sense out of the chaos that followed Edward’s policies and reliance upon his favourites – Piers Gaveston and then Hugh Despencer. Not that the council’s policies did much good. Berwick was lost to the English in 1318 and Edward’s favourite, the avaricious Hugh Despencer, so successfully irritated the nobility (who were already a tad tetchy about Edward II’s whole management style) that they revolted. The flames were first fanned into open revolt on the Welsh Marches where nobles including the Earl of Hereford and Sir Roger Mortimer found that their land was prey to Despencer and his father. The Earl of Hereford was, according to the Lannercost Chronicle, Roger Clifford’s father-in-law so it was almost inevitable that he should have been drawn in to the conflict. As is always the case, history is not necessarily clear-cut. Another source states that Roger Clifford was unmarried at the time of his death, his marriage having been annulled but more of that shortly. It should also be added that Despencer had helped himself to some land belonging to Roger’s mother the heiress Maud de Clare giving Clifford more than enough reason to take up arms. Edward realizing that he was on the verge of loosing his kingdom exiled Despenser and called on his loyal subjects to tackle Thomas of Lancaster and his cronies. Mortimer and the Welsh marches were subdued in January 1322. A northern army led by Thomas of Lancaster posed more of a threat. On Tuesday, then, after the third Sunday in Lent, being the seventeenth of the kalends of April [16 March 1322], the aforesaid Earls arrived in force, and perceiving that Sir Andrew had anticipated them by occupying the north end of the bridge, they arranged that the Earl of Hereford and Sir Roger de Clifford (a man of great strength who had married his daughter) should advance with their company and seize the bridge from the pikemen stationed there, while the Earl of Lancaster with the rest of the cavalry should attack the ford and seize the water and ford from the pikemen, putting them to flight and killing all who resisted; but matters took a different turn. For when the Earl of Hereford (with his standard‑bearer leading the advance, to wit, Sir Ralf de Applinsdene) and Sir Roger de Clifford and some other knights, had entered upon the bridge before the others as bold as lions, charging fiercely upon the enemy, pikes were thrust at the Earl from all sides; he fell immediately and was killed with his standard‑bearer and the knights aforesaid, to wit, Sir W de Sule and Sir Roger de Berefield; but Sir Roger de Clifford, though grievously wounded with pikes and arrows, and driven back, escaped with difficulty along with the others. But during that night the Earl of Hereford’s men deserted and fled, because their lord had been killed, also many of the Earl of Lancaster’s men and those of my Lord de Clifford and others deserted from them. When morning came, therefore, the Earl of Lancaster, my Lord de Clifford, my Lord de Mowbray and all who had remained with them, surrendered to Sir Andrew, who himself took them to York as captives, where they were confined in the castle to await there the pleasure of my lord the King. Roger had been seriously wounded but it didn’t save him from Edward II’s wrath. In March 1322 the motte and bailey castle at York gained a new name when Roger Clifford was hanged in chains from its walls. Clifford may have given his name to Clifford’s Tower but his lands from Hartlepool to Westmorland were confiscated by the crown. A man found guilty of treason not only forfeited his life but also the wealth of his family. 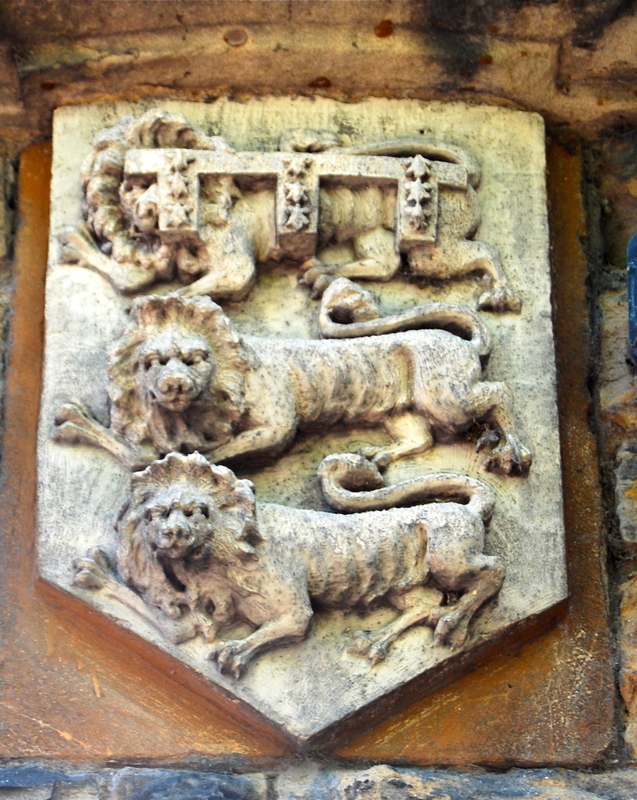 In this case the third lord was Roger’s brother, Robert (the good news is that everything was restored in 1327). The king played fast and loose with the laws of the land when he confiscated many of the Clifford estates. There were rules about dower lands and entails which should have resulted in Robert, who was a minor, keeping more than he did but wars cost money and besides, Edward II had favourites to please. Two thirds of the Clifford estates were bagged by the crown. The third that remained had come into the family along with Maud de Clare. Roger died without legitimate heirs although folklore, as recorded by William Wordsworth (yes – the William Wordsworth) notes that Roger had a mistress by whom he had a number of children (allegedly). Julian of the Bower (yes I know it’s a boy’s name) is supposed to have been so beloved of Roger that he had a house built for her near Penrith in the Whinfell Forest. Julian’s Bower is not without controversy. The name is given to turf mazes across the country and Julian’s Bower near Penrith may or may not be the remnants of a medieval love nest given that Nicholson and Burn in their county history identify its origins as Roman. There is no reason given for Roger’s marriage being annulled but then much of Roger’s personal life seems to be as nebulous as will o’ the wisp. 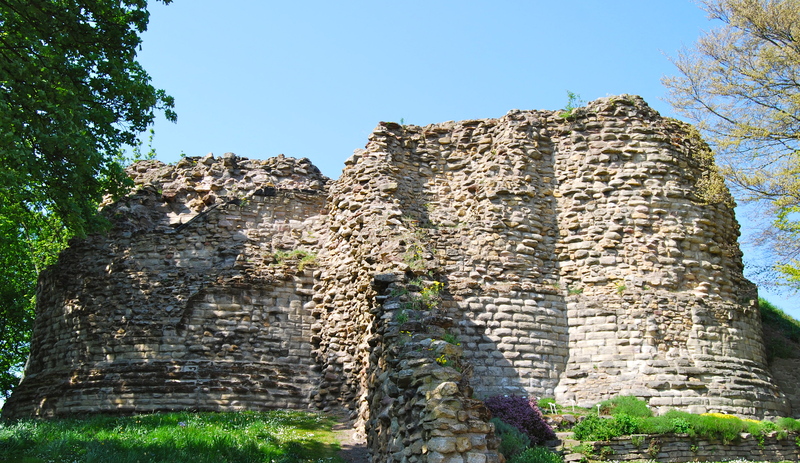 Wolsey, on his way back to London in disgrace commented of Pontefract Castle, “Shall I go there, and lie there, and die like a beast?” Perhaps he was thinking of King Richard II who starved to death in the great fortress. The Normans built their motte and bailey on the Anglo-Saxon Royal Manor of Tanshelf. It’s builder was Ilbert de Lacy. Ilbert and his brother arrived in 1066. The new Lord of Pontefract had done well out of the conquest and didn’t forget to show his gratitude by making gifts to both Selby Abbey and St Mary’s Abbey in York. As the centuries progressed so did the castle until its eight towers dominated the town and the landscape beyond. Edward I described it as ‘the key to the north’. 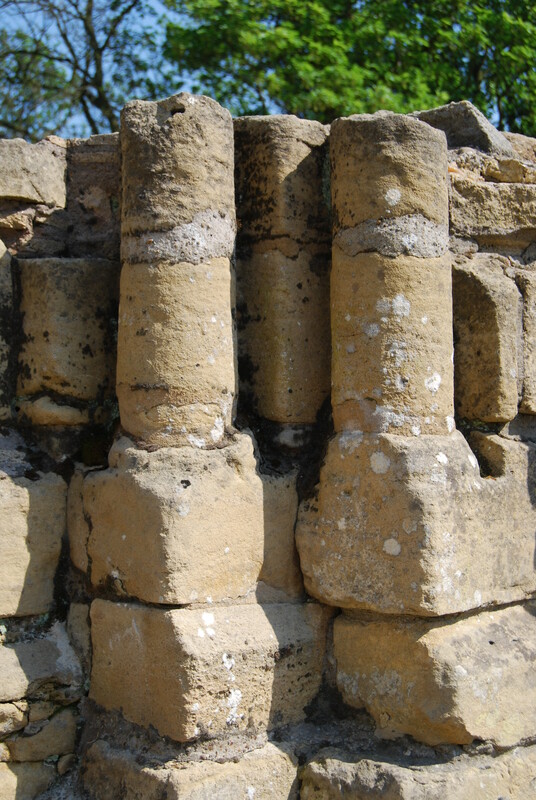 The de Lacy’s continued to be its custodians until Henry de Lacy (Earl of Lincoln) lost his male heir when he fell off the battlements in 1310. His daughter Alice an important heiress was married to Thomas, Earl of Lancaster so it was he who became the next custodian of the castle. He was Edward II’s cousin and it would be fair to say that they didn’t see eye to eye. By 1318 Alice and Thomas were separated – possibly because of the fraught political situation of the period or perhaps because they just didn’t like one another. Alice spent most of her time in Pickering while Thomas lived a bachelor life. Thomas eventually revolted against his cousin on account of the Despencers, made an alliance with the Scots and then rather unfortunately lost the Battle of Boroughbridge in 1322. He was taken back home to Pontefract and unceremoniously executed looking towards Scotland which was the direction of his treachery. Eventually the castle passed into the hands of John of Gaunt and from there to his son Henry Bolingbroke who became Henry IV when he usurped his cousin’s throne. Richard II found himself locked in one of Pontefract;s dungeons and that was the end of him. Pontefract was now a royal castle and its prisoners reflected its importance and its security. In 1405, Richard Scrope, Archbishop of York was imprisoned here before his execution. James I of Scotland spent some time here as an unwilling guest as did the Dukes of Bourbon and Orleans after their capture at Agincourt. Richard Neville, Earl of Salisbury was executed here in 1460 and in 1483 Richard of York had Earl Rivers and Lord Richard Gray imprisoned here and executed – which was one way to reduce the Woodville influence at court but hasn’t reflected well on the man who became Richard III mainly because the two half brothers of the boy king Edward V were executed without trial. The castle had a grim reputation which is perhaps something that Catherine Howard (Henry VIII’s Fifth wife) ought to have reflected upon before she started her affair with Thomas Culpepper during a Royal Progress. Pontefract Castle’s days of greatness and terror drew to a close with the English Civil War. After the Battle of Marston Moor the castle became a Royalist stronghold. Parliamentry forces besieged it and when it finally fell in 1648 the mayor of Pontefract petitioned on behalf of the townspeople that the castle should be destroyed. Work began in April 1649. Today a few fragments of the castle remain. The curtain wall encloses a park which hides a grim secret. Some thirty-five feet beneath the grass there lurks a network of cellars and magazines which were once Pontefract Castle’s dungeons. Thomas of Lancaster was not Edward II’s favourite cousin. After all, it was Thomas who was responsible for capturing Edward’s favourite Piers Gaveston and it was Thomas who handed Piers over to the Earl of Warwick and it was Thomas who sat with Warwick in judgement on the favourite. It wasn’t a happy outcome for Gaveston who found his head separated from his shoulders. The royal cousins patched things up in the short-term but following the Battle of Bannockburn in 1314 when Edward was a rather inglorious runner-up – or perhaps that should be runner away. Lancaster was able to take the moral high ground and wrested power from the king’s hands. Matters weren’t helped by the fact that the barons were resentful of the king’s bad governance, his failure to beat the Scots and the fact that moderate nobles such as the Earl of Gloucester died at Bannockburn. It was inevitable that there would be some form of civil conflict. The trigger was Edward’s new favourite, Hugh Despenser – a particularly unpleasant individual if the chronicles are to be believed. He acquired land that had belonged to Gloucester on the Welsh Marches and then took the opportunity to help himself to a bit more as well. Men such as the Mortimers, Cliffords and even the Earl of Hereford found their land holdings in Wales threatened by Despenser and Lancaster found himself with several very enthusiastic supporters. The time seemed ripe. He elicited support from the Scots and gathered his army. Luck, however, was not on Lancaster’s side. First he lost many of his stores while trying to ford a flooded river. The king’s army, under the command of the Earls of Surrey and Kent, was larger than expected and Lancaster found himself moving north rather than south. He wasn’t blessed with particularly talented scouts either. No one spotted the King’s northern army under the command of Sir Andrew de Harcla heading south to join with the main army. Lancaster found himself trapped between two forces loyal to the king. The rebels had no choice but to take the bridge at Boroughbridge if they wished to escape but when they arrived they discovered that de Harcla had got there first. The bridge was guarded by his knights and men-at-arms while the river banks were lined with his archers. At first, the exchange was limited to arrows singing across the river. It was stalemate, until that is, the Earl of Hereford attacked the bridge in heroic style. It was unfortunate that armour did not protect the lower regions because Hereford was disembowelled by one of de Harcla’s spearman who’d climbed under the bridge. There was a moment of panic that saw Roger de Clifford the heir to the castles of Appleby, Pendragon and Brougham felled by an arrow. The rebels withdrew but in good order. Thomas of Lancaster was forced to parley with de Harcla. He reminded the knight that he’d gained his spurs from Thomas himself. He promised that if de Harcla changed sides that there would be other and greater rewards. De Harcla refused. Finally Thomas agreed that he would surrender the next day or suffer the consequences. Thomas went off for a good night’s sleep in Boroughbridge. De Harcla and his men spent an uncomfortable night watching the bridge. Personally, I like to think that de Harcla wanted his old mentor to slip through the lines and make his escape because the next morning hostilities didn’t recommence until the arrival of the Sheriff of Yorkshire. 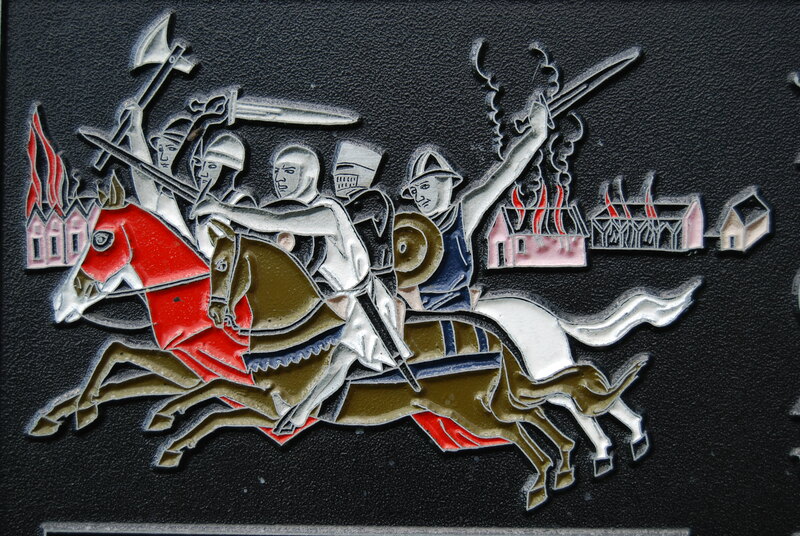 De Harcla began his attack on the town (the image of the battle with the burning houses gives some indication of Boroughbridge’s plight). There was no more choice in the matter. Lancaster’s army fled. Lancaster himself sought sanctuary in a chapel just off the market square. His sanctuary was not respected. These days Boroughbridge is much more peaceful I’m pleased to say and the ramshackle wooden bridge that crossed the River Ure is decidedly more solid these days. Where de Harcla’s men once lined up to stop Lancaster’s army there’s a picnic area. 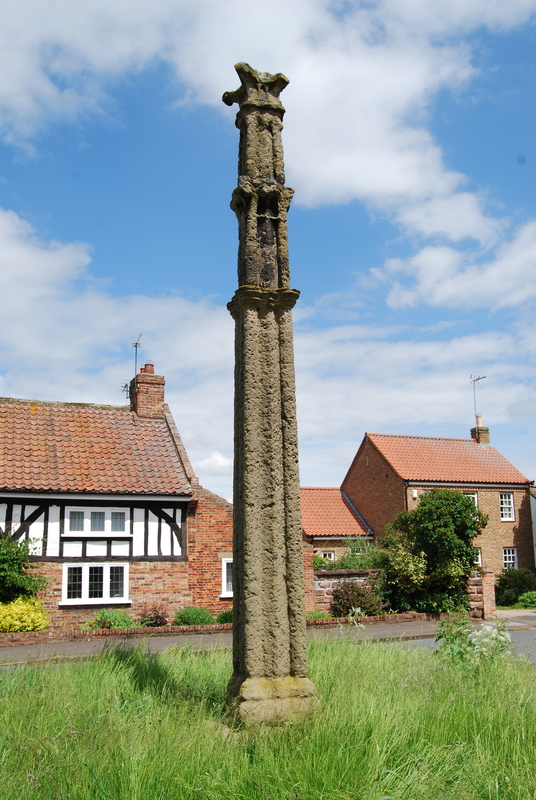 There are some handy interpretation boards with some delightful illustrations along the way and at Aldborough there’s an opportunity to view Boroughbridge’s Battle Cross. Up until the Victorian period it had stood in the market square for five hundred years – one of the country’s earliest war memorials perhaps? When we set off on the four mile walk around the site of the battle the sun even shone – it was the beginning of June and although we didn’t realise it at the time but it was one of the few hot summer days of 2012. Having said that we did have to pick up our pace over the last mile or so on account of the rather heavy storm cloud that threatened. Better a soaking though than the fate that befell Thomas of Lancaster. He was dressed in his servant’s clothes, paraded through the streets of York, pelted with mud and then tried in his own castle – Pontefract. When they executed him – they made him face in the direction of Scotland. Thomas of Lancaster was the son of Edmund Crouchback who was the second surviving son of King Henry III. Crouchback refers to the fact that he fought in the ninth crusade so was entitled to wear a cross stitched onto the back of his clothes – no Richard III tendencies. But I digress, Thomas of Lancaster is the grandson of Henry III, just as Edward II is the grandson of Henry III – making them cousins; though they clearly weren’t the kissing variety by the end of Thomas’s life as this rather graphic image from the Luttrell Psalter demonstrates. He was one of the richest and most powerful men in the country. He held five earldoms, was the Sheriff of Lancashire, the Steward of England and held several key strategic castles in the North including Pontefract. He fought in Scotland during Edward I’s wars and when Edward II was crowned he carried Edward the Confessor’s sword during the coronation ceremony. The main problem was that Thomas and Piers Gaveston, the king’s favourite could not stand one another. It didn’t help that the upstart Gaveston was given a more important role during the coronation or that he referred to Thomas as ‘the churl’ or ‘the fiddler’. Despite this Thomas was initially loyal to his cousin. But as time went by it became apparent that Edward was blind where his favourite was concerned. Thomas was part of the group of barons who saw Gaveston banished- for the third time it might be added- but when the royal favourite returned to England in 1311 to spend Christmas at court despite Edward II agreeing to his banishment hostility was almost bound to break out into violence. In Spring 1312 Edward and Piers were forced to flee York when they heard that Thomas of Lancaster was leading an army in their direction. They fled to Newcastle, leaving the pregnant Queen Isabella to deal with the irate earl as best she could. Unfortunately for the king and his friend, Thomas of Lancaster swiftly changed direction and surprised the monarch in Newcastle. Apparently the king and Piers fled with little more than they wore. It took Lancaster four days to catalogue everything that had been left behind while the king and his crony found a ship to take them south to Scarborough. Edward demanded his fortress of Scarborough back from the control of the Percy family which they obligingly handed over and Edward left Piers Gaveston in charge. Once Thomas ascertained that the king wasn’t in residence, he besieged the castle and Piers surrendered being more of a courtier than a warrior. Thomas took Piers south for trial but the Earl of Warwick – nicknamed the ‘Black dog of Arden’ by Gaveston (and who definitely wasn’t one of Gaveston’s admirers) took the royal favourite out of Thomas’s hands, tried and executed him. Following the disaster of Bannockburn in 1314 Edward was forced to submit to his cousin and it was Thomas who tried to rule for the next four years. It would have to be said that Thomas was a bit of a thorn in Edward’s flesh prior to this period. He refused to attend parliament and there is some evidence that he didn’t send enough men to aid his cousin against the Scots. It was during this time that Scottish raiding along the borders became prevalent and in 1318 Thomas fell from power. In 1321 Thomas was at the head of a rebellion once more. He met with forces loyal to the king at the Battle of Boroughbridge where he was taken prisoner, tried and finally executed at Pontefract Castle – for treason and rudeness towards Edward…which certainly puts a whole new meaning on the naughty step…oh yes, and for plotting with Scotland. He was buried in Pontefract Priory (a Cluniac monastery). All that remains of the Priory is the name Monk Hill.